The new Ford Mustang GT is one of the best sports cars in the world. With its newest redesign, the engine has a totally different style, as well as the front end. The grill and head lamps have changed as well. With these new performance options, you’ll also notice that there are features for the exhaust as well. 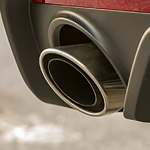 The Active Valve Performance Exhaust system was added to make it so you can start the GT with a whisper quiet exhaust to save your neighbor’s ears. The Mustang GT is also well known for its new engines, two transmission styles, and five performance settings. You can customize everything about your driving experience with the latest GT. It’s the best way to experience driving the way you want. Have you seen the new Mustang GT? You can now test drive the GT or other trims when you visit McMullen Ford located in Council Bluffs.